A tiny part of Haraganga College. I had little idea that my trip to Bikrampur last fortnight would set off such a wide range of new realisations in me so as to prompt a sequel to my earlier piece titled “A Fabulous Rediscovery”. A modern management buff says, individuals who obsessively chirp about their past have lost their relevance for the present. As a recruiter to mid and senior level positions he has come to realise this, after burning his finger whilst making do with whatever was available on the dossier of short listed candidates. He now sticks by the rule of the thumb that anyone gloating over his antecedents is no good for the job on offer -- at least in nine out of ten cases. He goes on to explain that braggarts of the past having nothing to offer for today, far less tomorrow, take refuge in yesterdays resting on their rusty laurels. Little wonder, they find themselves by the wayside. This is a nursery book rhyme-type tip in the post-modern management era flourishing on ever newer slews of ideas of branding, redefining and repackaging rolled out by brainy, super innovative and feet-in-the-futuristic world generations. As this neo-or post-modernity surge overwhelms us, the nostalgia for – ah, those good old days, those pristine times – “ain't what it used to be”, says Yogi Berra more with wit than regret. Much as we marvel at the progress of knowledge, science and technology we have the agonies of living in an increasingly troubled, self-complicated and uncertain world. You hear people say with conviction that the passing day is a good day; it may not be the same tomorrow -- it never is; for it dawns on a little more uncertain note than the day before. Nostalgia and reminiscences maybe regressive in the hard-boiled temporal world of today where the ever challenging mundane leaves little time for pause and reflection. But occasional nostalgia can be recreational, inspirational and soul soothing. President Obama has a vast repository of it -- from Kenya through Indonesia to the US -- which is why he is such a natural author of books, his ease of writing sharply contrasting with the difficulty of his presidency. When old friends meet after a time lag of little more than five decades -- devoid of any contact, direct or indirect, in-between – it is as though a new pair of men interfacing almost like strangers to each other. But from out of the misty past comes zooming a face across the mind's eye that mystic familiarity stamped on a certain smile or a notorious blink, the aging skin or flaccid facial muscles regardless. I had such a reunion with Nirmal Chandra Chakrabarty, retired professor of English of Haraganga College and Prasanta, a school teacher, two of my schoolmates. Nirmal is the son of late Sudhir Chandra Chakrabarty, our English teacher in Munshiganj High School. Nirmal, a lifelong bachelor and Prasanta whose spouse a retired district education officer, have been dedicated teachers. They live together in a single-storied house in an idyllic setting by Dhaka standards. My visit was a complete surprise to them as they took time reconciling to what they were seeing. Nirmal is a highly reputed teacher constantly under pressure from the new genre of Haraganga College students scrambling to be tutored by him. But Nirmal who is looking after his widowed sister and his niece is given to frugal and honest living. He has the least use for money other than what he had saved on retirement. He just teaches one batch of students, he can do justice to, rather than biting more than he can chew. He is self-sacrificing to a fault: he did not accept offers of promotion just to avoid being transferred out of Haraganga College, a government institution. Haraganga College, established by philanthropist Ashutosh Gangapadhya was inaugurated by Sher-e-Bangla AK Fazlul Haque, Premier of Bengal and minister in charge of Education on December 18, 1938. Prof Serajul Islam Chowdhury, Abdullah Abu Sayeed, and AMA Muhith were among its teachers, Prof Islam having been its Principal as well. Harendralal Public Library is 'a gold mine' having on its racks, a rare Sanskrit to English Dictionary and the Historians' History of the World in 25 volumes, the latter presented by Earl Lytton, Governor of Bengal, in 1923 (courtesy: Principal, Haraganga College). 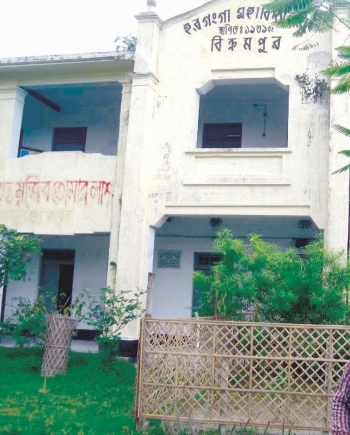 Across the shooting range that is no more and to the east of Haraganga College used to be the Munshiganj High School Hostel where we three brothers were billeted, my father leaving us on transfer, so we could appear at the annual examinations. Thus the three of us, all under-teens, had our first test of self-managing and a taste of freedom, too. The lasting memory from those days was one of waking up before sunrise and sitting on the verandah looking far out to the crimson-flickered horizon to spot a man as if emerging from the rising sun as an avatar. He walked to us eagerly waiting, with a basket of bhapapitha (smoked rice cake) that melted onto our palate under the soft rays of the sun. It was a delicious breakfast!